Avid Media Composer is a powerful cross-platform video editing application, giving the professional editor the flexibility they need to work the way they want to, with a myriad of customisation option. If you’re looking for an industry standard, complex and full featured solution for a price, you’ve come to the right place. Avid is the granddaddy of video editors. It’s been there since the beginning and still commands a lion’s share of the professional video editing market. It is the industry standard, and although an increasing number of films are also cut on Adobe Premiere and Final Cut Pro, chances are high that if you’re going to be working in a professional environment, this is what you’ll be sitting in front of day after day. Media Composer Ultimate is Avid’s top of the line video editing software for Windows and Macs, and it is not for the fainthearted. 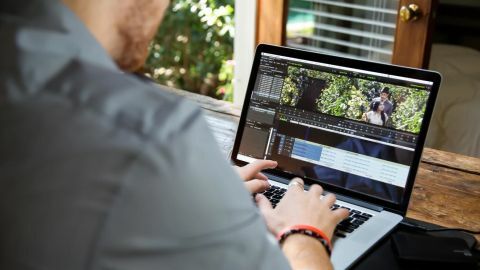 Although the interface is immediately recognisable to anyone who’s used any other type of video editing software, its customisability will please those who are into creating the work environment that suits them perfectly. Every part of the interface is a floating window, which can be resized and moved around. You can also find in the Tools section additional optional features which you can bring to the fore, should you need them. The customisation options are legion. Here, we’re focussing more on audio levels. You can dock windows within windows and switch between those just as you would between tabs of your web browser. You can make the menu’s font bigger - the customisability is impressive, and we haven’t even begun editing yet! Before you start, you first need to set your project’s dimensions - you’ll notice you can create projects up to 16K, and even create formats with custom height and width, which is ideal if you’re looking to create web banners, or promos for expositions for instance. Importing media can be done in a variety of ways. If you work with a tape deck, you can connect it to your computer and log and capture the footage. If your camera records to an internal hard drive, hook it up and use the Source Browser to import the footage. Any media already stored on one of your drives can be added to Media Composer in the same way, although you can choose to either import the footage or merely link to it - the latter saves space but you need to make sure that drive is kept connected in order to edit with your chosen media (which is why linking is never recommended when importing footage from a camcorder - for this software or any other video editing package). Transcoding/converting the imported footage can take a while though. Media Composer also handles EDL imports as well as layered Photoshop files, among many other formats. You can put your imported footage into bins (aka folders), helping you organise yourself as you gather up the resources you need to create your project. From there, you can double-click on a clip to preview it, set in and out points and add your selection to the Timeline. A quick peek at the main editing interface, looking pretty much like any other video editing application. As you’d expect, all the tools you need to cut your movie are available to you, and the experience is similar to other video editing software. Media Composer grants you access to 24 video tracks and 64 audio tracks, enabling you to create quite complex sequences. Media Composer has a feature Avid calls Live Timeline. Put simply, you can playback your sequence while working on other sections of the interface, such as creating bins, moving windows around, or soloing or muting audio tracks; none of this should stop playback. In our experience, this really depends on how powerful your computer’s CPU is, but it is a welcome addition nonetheless. A lot of the navigation and editing seems to work better via the keyboard. So much so in fact that the keyboard itself is fully mappable and customisable. You can still edit predominantly with the mouse, but if you take the time to familiarise yourself with the keyboard layout, you’ll appreciate the benefits in the long run. If you’re new to Avid, you may find yourself a little overwhelmed. There is however a very detailed help section, but it assumes that you know your way around a video editing package - again, this app is not for novices. One of Media Composer’s powerful features is multicam editing, and there’s even a highly useful auto-sync function to sync up all the different angles. This process is based on waveform analysis and a recent update has migrated this feature away from multicam and into one-camera shoots, for filmmakers who record audio and video on separate devices (this works as long as the video clip also recorded audio which Media Composer can then match up). A new feature to Multicam editing is the ability to add another camera angle after the Multicam Editing Environment has been created. This is a great benefit to the editing process as you don’t have to have all the clips ready before starting work on your sequence. The filters, transitions and available audio tracks are displayed as a list with no preview of their functionality. Of course, no editing application would be worth its salt without including effects to improve the quality of your audio and video. Media Composer comes with a wealth of these, from audio ducking, punch-in tools, and the ability to alter the sample rate, to video effects including colour correction, timewarp and stabilisation technology. You obviously have a good selection of transitions to choose from, and can also include titles to your project through a couple of title software packages included with Media Composer. You can change the workspace to ease your colour correction work. Speaking of what’s included, it’s important to take a look at your ownership options. Although you can purchase the software outright (known as a ‘perpetual licence’), Avid is strongly pushing the subscription model, even including additional apps like Symphony (think of it as Avid’s AfterEffects) in the Media Composer Ultimate subscription package. Also, the difference between Media Composer and the Ultimate version is that the latter includes the ability for editors to work in a collaborative environment. If you have no need for this, you may be better off forgoing the Ultimate version. Media Composer is a powerful bit of kit, designed to work in conjunction with hardware add-ons, but you can also edit with it as a standalone piece of software. If you’re serious about editing, this is likely the way to go, although it’s not a cheap option. We would argue that you should only get it if you’re planning on becoming a professional editor. If you’re on the fence, the software comes with a 30-day free trial, so you can put it through its paces yourself with no risk or obligation.